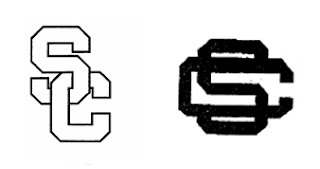 The Trojans of USC (California) topped the Gamecocks of USC (South Carolina) in a Section 2(d) opposition proceeding involving their respective SC logos. The Board explicated its reasoning in an exhausting 93-page decision penned by Judge Charles Grendel. This posting will provide a highly-condensed version of the Board's duPont analysis and its discussion of the priority issues. University of Southern California v. The University of South Carolina, Opposition No. 91125615 (August 1, 2008) [not precedential]. Carolina sought registration of the logo mark shown above for "clothing, namely, hats, baseball uniforms, T-shirts, and shorts." California relied on two registrations, one for the standard-character SC mark for various goods, including clothing, and the other for the logo shown on the left immediately below for various goods, also including clothing. It also relied on common law rights in the logo shown on the right immediately below. The Board logically dealt with the three pleaded marks one at a time. The SC Standard Character Registration: As to California's incontestable, standard character SC registration, the goods in classes 6, 18, and 14 were limited to "goods being offered and sold to persons through university authorized channels of trade," while the goods in class 25 were (significantly) restricted to "goods offered and sold at university-controlled outlets." The Board found the Carolina mark to be confusingly similar to the SC mark, but as to the goods, it deemed confusion unlikely because of the trade limitation on the class 25 goods in the pleaded SC registration. Although it must presume that Carolina's goods move in all normal channels of trade, "California's Class 25 trade channel limitation eliminates any possibility that purchasers might encounter Carolina's Class 25 goods in California's trade channels, or vice versa." However, the Board found confusion likely between Carolina's clothing and California's non-clothing goods: keyrings, tote bags, back packs, towels, blankets, and the like. The Board deemed these goods to be related based upon third-party registration evidence and on the parties' own sale of apparel and non-apparel items under their respective marks. The "authorized channels" limitation on the non-apparel items in the registration, the Board ruled, meant that California's goods could move (and indeed did move) in the same channels as those of Carolina. The SC Logo Registration: This registration contained no restrictions on trade channels. The Board found the clothing items closely related or identical to those of the opposed application. Noting that, when goods are identical a lesser degree of similarity is needed to support a finding of likely confusion, the Board ruled that the marks are "sufficiently similar" to result in source confusion. The Common Law SC Logo: California's assertion of common law rights hinged on its proof of priority. Carolina asserted that it has been using "SC" since the university was founded in the early nineteenth century. It argued that "the State of South Carolina has used and been referred to as 'SC' since pre-Revolutionary War times, and that because Carolina is an agency of the State of South Carolina, it is entitled to rely upon any such use of 'SC' by the state for purposes of determining priority in this case." California claimed use of "SC" in connection with its educational services and athletic goods for more than 100 years, and maintained that Carolina's asserted rights were lost as a result of several periods of non-use over the past century. The Board, however, observed that the issue here is not the SC abbreviation, but the specific design mark that Carolina seeks to register. It found that Carolina "has no legally equivalent mark the prior use of which it can tack onto its proven and constructive 1997 date of first use." The Board found that Carolina's priority rights date back only to 1997 (ironically, when it re-adopted a throwback mark that it had stopped using in the 1950's). Carolina had used in 1991 an interlocking SC mark that looked just like the registered California logo above, but that earlier mark was not "legally identical" to the applied-for logo, and therefore use of that mark could not be tacked on. [Note that the Board found the California registered logo to be confusingly similar to the Carolina applied-for logo, but that is a different, more relaxed test than that for "tacking."] In any case, California established common law rights dating back before 1991. The Board then found the marks confusingly similar for the same reasons as set forth regarding the other two California marks. Carolina's Counterclaim for Cancellation: Finally, Carolina sought cancellation of California's logo registration on Section 2(d) grounds. However, the Board found no evidence that Carolina had used any "SC" mark between 1982 and 1991, and as a result its priority date was "reset to 1991." Moreover, the logo mark adopted in 1991 was abandoned in 1998 in favor of the applied-for mark. Finally, Carolina's reliance on use of "SC" by the State of South Carolina was unavailing, because the Board found such usage to be "purely informational" and irrelevant to the priority claim at issue. Thus Carolina failed to beat California's 1994 priority date for the registered mark, and its counterclaim failed. In sum, the Board sustained the opposition and dismissed the counterclaim for cancellation.